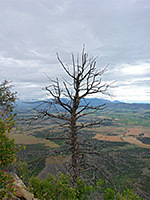 Like the other two paths that start from Morefield Campground on the north side of Mesa Verde National Park (the short Knife Edge Trail and the much longer Prater Ridge Trail), the Point Lookout Trail does not encounter any ancient sites; instead it climbs quite steeply to the top of a narrow, elongated mesa then continues to a spectacular viewpoint at the northern tip, where the ground falls away vertically on three sides. 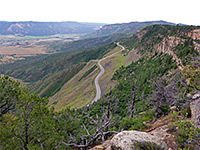 In the foreground are the switchbacks of the park entrance road, over 1,000 feet below, while beyond are the flat lands of the Mancos and Montezuma valleys, and in the distance, more ridges and valleys leading to the foothills of the San Juan Mountains, the views extending over 50 miles in some directions. Also of interest along the trail, in summer, are the wildflowers, as the wooded mesa sides and more open land on top are home to a good variety of species. The trailhead is right at the end of the road past the campground, at a parking area next to the amphitheater. 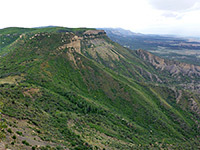 The camp sits in a little valley, bordered by the Point Lookout mesa to the east, Prater Ridge to the west, and a smaller summit (Lone Cone) to the north; all three of these elevated areas are formed of a resistant layer of light brown, cross-bedded sandstone, the Point Lookout Formation. 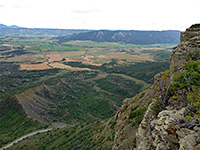 The trail is flat at first, crossing a field of sagebrush and rabbitbrush, before entering quite dense oak and juniper woodland, and starting a steady climb, winding through two dozen short switchbacks. 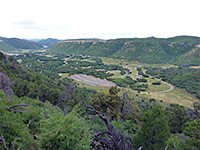 After a while it enters a patch of taller pine trees, where the slopes are covered with numerous brown sandstone boulders, mingling with the undergrowth. The gradient is steeper near the top of the ascent, and the trees somewhat smaller. 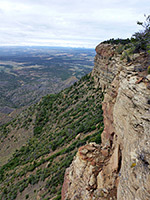 Once on the plateau, the path, now level, runs northwards close to the west edge, and soon has views to the east as well, since the mesa narrows, becoming just 50 feet across. Many wild onions bloom in early summer, amongst the short oaks and pines; other prominent flowers include beaked beardtongue and scarlet gilia. Towards the end the mesa widens a little and the path has good viewpoints on both sides, before the main overlook, to the north.